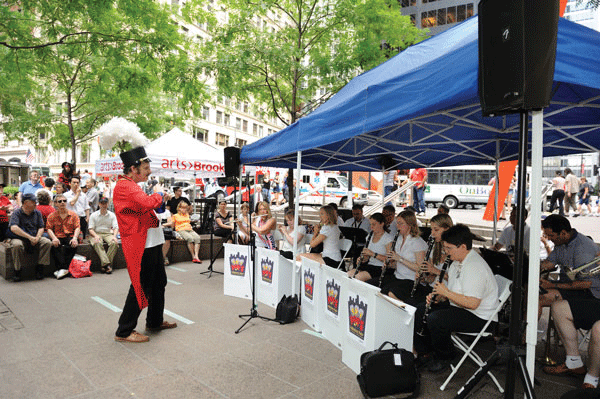 Local Snub to the downtown all-community band!?! Tom Goodkind, conductor of our favorite local marching band, the TriBattery Pops, tells us the powers that be at the M.T.A. won’t let them play the classic Billy Strayhorn tune — made famous by Strayhorn’s musical mentor and collaborator, Duke Ellington — at the grand opening of the Fulton Center subway station next Thursday. Goodkind said Assembly Speaker Shelly Silver’s office has been helpful making the case for the Downtown band to play for free, but the idea remains stuck in the station. Naturally, he does not have good or kind feelings toward the snubbing authority, particularly after rehearsing the song for six months.